We work to the deadlines you provide us. Plain fans are usually dispatched within 3 days. We offer express delivery on some of our products. If we cannot meet your deadline we will tell you straight away. As a general rule delivery times for personalised and promotional products is approximately 3-4 weeks depending on the order quantity. For large volume orders of 5,000 or more it can sometimes work out cheaper for longer lead times of 8-9 weeks. We will always use the most efficient logistics companies to ensure that we get your order to you on time. Can you personalise the fans? 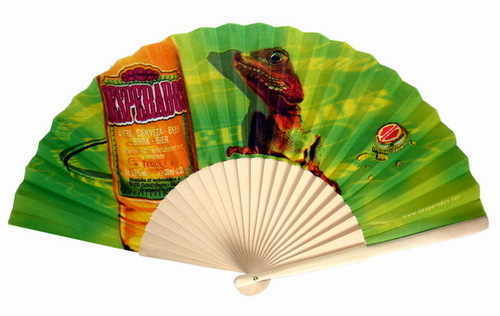 Yes, the majority of our fans can be personalised depending on the product, material to be personalised and your logo. Personalisation of products is usually carried out at source. I only want a few fans customised with my logo. Can you still supply? Due to print set up costs it is not feasible to produce small quantities. Minimum quantities that apply for customised fans are indicated next to the item. You can place your order online or for personalised fans you may contact us via our online enquiry form and we will go through your specific requirements and supply you with a competitive price and delivery date. Yes. Please contact us via our online enquiry form about your requirements and we can send you samples of the relevant items, or if you’re after a bespoke product we can make pre-production samples for you at additional cost. Samples are usually charged for and refunded upon placement of order. What format do you need the artwork in? We accept artwork in Adobe Illustrator, PDF, EPS or high resolution jpeg files. Is it cheaper to print one colour on the fans? On the paper fans our print charges are for logos up to 4 colours. The standard method is a four colour process print (CMYK). It does not make a difference to the price if you only choose to print one or two colours. For fabric fans silk screen or offset printing is used therefore prices vary according to the number of print colours used in the design. I don't have any design expertise. Can you produce a design for me? Yes, of course. Whilst it is usually quicker if you supply the artwork to us, you can use one of our designers to produce a bespoke design from logos supplied or a complete creative concept. Our charges are £35 per design produced. The usual turn around time is 48 hours from receipt of logos/artwork brief. What are the UK and International shipping / postal charges? Postage and packaging depends on the final order value and weight and is calculated upon checkout. We also offer international shipping. Are the fans environmentally friendly? All of our paper fans are traditional handicrafts and made using traditional japanese folding techniques (origami). This means that we do not use any machinery during the production process. Our promotional paper hand fans are not made from recycled paper, however both the paper and the bamboo frame it is constructed from is fully recyclable. Bamboo is a natural, sustainable resource. We are looking into the possibility of making the fans from recycled paper. This is a medium-long term project as we are currently in the process of sourcing suitable suppliers of 100% recycled paper. We are one of the few manufacturers in Europe that use 100% Green Cotton for the fabric fans. Do you use a secure online ordering process? Yes. Our online transactions are processed via PAYPAL or NOCHEX which are safe and secure payment process services allowing you to pay via credit/debit card or bank account without revealing your card number to us. I have an idea for a product, can you source it? Of course! We will work with you to find the most effective solution and source bespoke samples for you from our manufacturers in the UK, Europe and the Far East. Small runs can sometimes be possible, so if you’re looking for something a little unique or an alternative source for your products, please contact us. If you are unhappy with your purchase, for whatever reason, you should contact us to arrange a return within 7 days of receipt. Providing the product are unused and in it's original packaging/condition, on receipt of the item we will issue a refund, this will exclude any postage, packaging and insurance costs that were incurred during the original order. Please note we are unable to accept returns or issue refunds on personalised or promotional fans. See our terms & conditions for full details. We always advise that you contact us prior to returning an item so that we can be aware it is being returned and easily match the return with your order. This will ensure that your refund is dealt with promptly.